I’ve a confession. At first migration to the Mid-Town neighborhood in which I still reside, I had frequented The Grove – weekly. It was the anti-mall mall before I realized that that could mean Disney. That was for shopping, however – all my dining excursions always took place in the nearby, historicÂ Farmer’s Market. So thanks to the PR company representing Morels, the French Bistro with the best people-watching in the entire mall (even with Christmas lights year-round to provide adequate lighting), I can now say I’ve dined at The Grove. I wasn’t quite sure what to expect – but I can say there were pleasant surprises. The drinks were unfortunately not one of them, as they were mostly cocktails that were sweet enough to be what I might describe as “stereotypically girly” and not exactly complex. 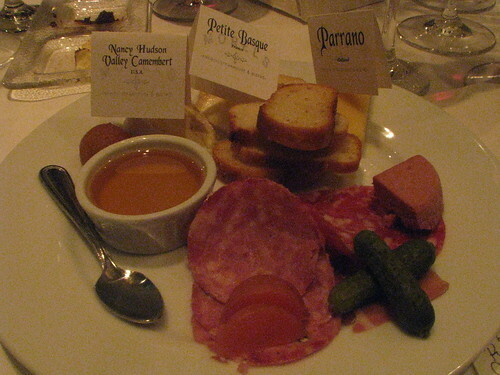 What I did enjoy was the cheese and charcuterie plate, which included Petite basque (sheep), Parrano (cow) & Nancy’s Hudson Valley Camembert (sheep), Prosciutto di Parma, garlic sausage, Rosette de Lyon salami and Dry mountain sausage. It was a nice combination of meats and cheeses, with the honey on the side being a nice touch as were the pickled radishes and French cornichon (get it – French bistro?). 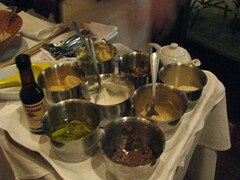 Another highlight was the Caesar salad – which comes with a custom-made dressing. The server will season your dressing to taste right alongside your place setting. I thought my Caesar was delicious, however, even without modification. The fact that there was the option to add more sour cream, garlic or anchovy – for example – made for an interesting twist on what would normally be another mindless pre-entree salad. Unfortunately, the main course of night – which was a beef tasting of sorts with Filet, New York and Rib Eye cuts – was rather unremarkable. The slices arrived with a steak sauce and were cooked with mostly salt; however, additional salt options were available on the table for the seasoning.Â Unfortunately, noÂ exotic salts can rectify ordinary steak.Â Brussel sprouts, bacon bits, carrots, potatoes and a soft root vegetable were sauteed and brought out on a hot pan to eat with the steak and were probably the most interesting feature of the entree. Short of my waving the foodie flag of buzz word “bacon” too many times in this post, it reminded me of my favorite dish at The Village Idiot – who serves up rather large brussel sprouts with generous bacon cubes and does the dish quite well, though meant to stand on its own instead of sprucing up plain, salted steak slices. The dessert was fall-themed and welcome (appropriate when coupled with rainfall that day). 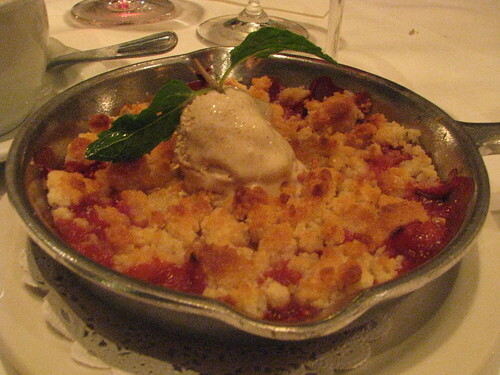 The warm rustic strawberry rhubarb cobbler came topped with crÃ©me fraiche in the pan. I’d consider ordering this with a friend after an evening of shopping. 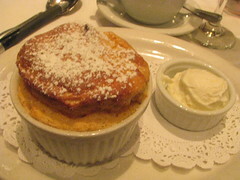 The pumpkin souffle came with soft cream and was also delicious – seasonally perfect as Thanksgiving nears. There are certain dishes that Morels does particularly well that are specific to them; unfortunately, steak decidedly isn’t one of the specialities on this “French steakhouse and bistro” menu. I wonder if the heavy foot traffic detracts from the incentive to improve their steak, but it’s good to know it’s a place I can pop in for a minute for reprieve from shopping and have one or a few of their reliable sides and desserts. Further reading: Red White and Rhone at Morels – Diglounge. This entry was posted in Food, Mid-City West and tagged Caesar salad, Cheese & charcuterie, French Bistro, French Steakhouse, L.A., los angeles, Mid-City West, Morels, Pumpkin souffle, Strawberry cobbler, The Grove. Bookmark the permalink.